Had a good day Thursday at Rocky Ford Creek. Had a strike on my second cast, but couldn't set the hook. Ended up with many strikes, three fish on, and two lost -- one was so big and fought so hard that he broke the 4.5 lb test line! The one I landed ended up about 21". It was a quick measure, mind you -- it was a tough fight and I wanted to get him back in the water quickly. Just a beautiful trout though, caught on a size 18 olive scud. thats a beauty of a fish! holy cow you need a lesson in handling a fish. Great fish. 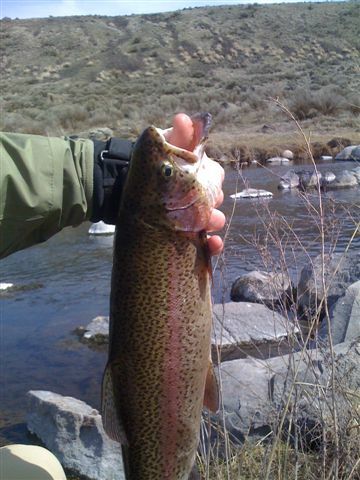 The brown is my favorite trout. What are you doing holding that fish like that ? Rocky Ford is catch and release, you shouldnt kill fish in places that are catch and release. Great Article! I have caught steelhead that big! Nice catch!